I have just finished reading Diane's brutally honest post on fabric addiction -- true fabric addiction -- and it has touched me deeply. 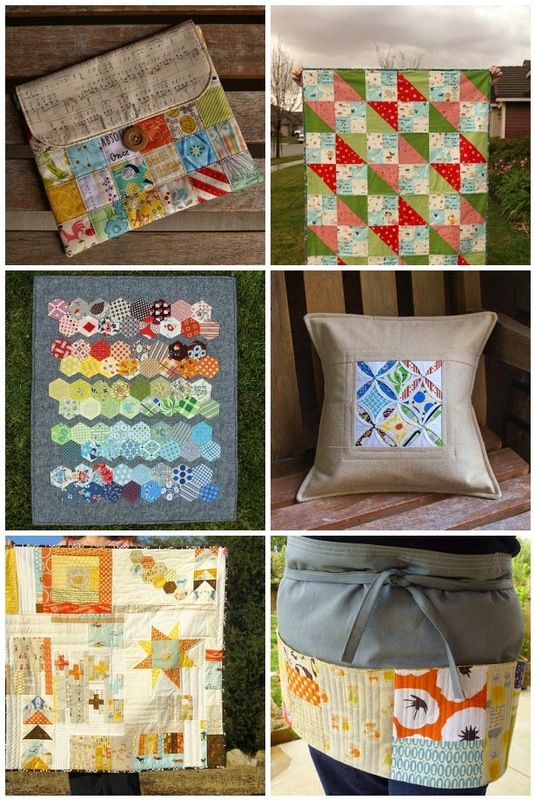 It was not so long ago that I was starting out in the online quilting world and had little to no money in our budget for any fabric purchases, let alone designer prints. I remember when my blog audience was a grand total of three, and when I couldn't seem to get anyone to consider my ideas for tutorials and projects. Back then, I had three little girls under the age of five and could hardly scrape out the time to sew at all. It wasn't easy, but I kept trying to do all I could with what I had...one slow step at a time. Over the past few years I have been blessed by family members who joyfully sponsored my hobby, friends who sent me special gifts, and companies who generously allowed me to work with their fabric and notions. Opportunities have come my way -- some that appeared by surprise and others that I had to chase after -- that I never dreamed I would really get to experience. I don't take this lightly. Not everything has gone the way I planned, but I am so grateful for the lessons I've learned through this journey. I know that I've been blessed by others, and it's my deepest desire to be a blessing to all of you through this blog and everything connected with it. Today, I'd like that blessing to come your way in the form of a care package. I'm putting together some special bundles this week to send out to three of my lovely readers. It won't be a huge package, but I promise, it will be a good one. Leave me a comment below telling me what you love: colors, designers, fabric collections, themes, solids vs. prints -- be specific! Also let me know in your comment where you live - your state if you're in the U.S. and your country if you're international. I'll be randomly selecting two U.S. readers and one international reader to win. The giveaway will be open through Tuesday at midnight. Be sure to include your email address in the comment if you're a no reply blogger so that I can get in touch with you. Please spread the word to any friends you may have, especially to those who you know could use a little pick-me-up right now. I can't send each of you a care package, but please know that I'm sending all of you a hug. Have a wonderful weekend! ...gathering a bag of scraps for a friend. 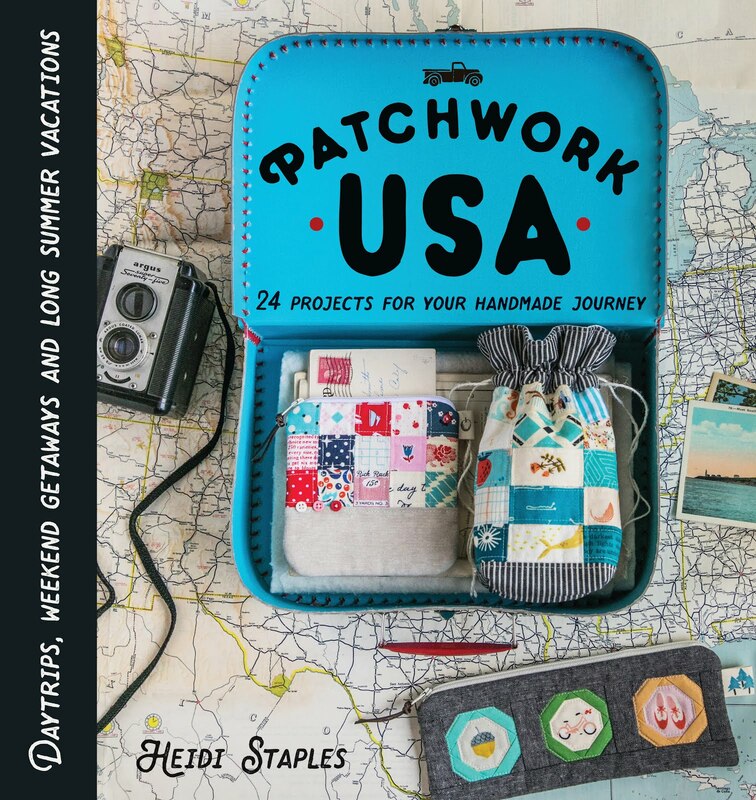 Look for the Craft Book Month Blog Hop and Quilter's Mixology Blog Hop, both coming in September! I've been a busy girl lately, trying to stay ahead of upcoming deadlines. At the moment I'm scheduled to be in four different blog hops next month, and that means a lot of sewing! Two of my projects come from the brilliant books you see above, both of which I highly recommend to you. I'm planning to write up a tutorial for my Tiger Tracks Satchel, and I have a few fun little projects on my "when I have time" list. I've also put in a bit of work on my book which is heading into the final editing stages this fall before it's released in the spring. I can hardly wait to share it with you! I'm the queen of the quick finish! When I'm trying to juggle housework, homeschooling our three girls, sewing deadlines, family activities, and daily errands, there's nothing more valuable to me than a project that I can make in a day or two. When I can work on something a little more complex, it's always a treat, but I've learned to make peace with the reality of my time limits for now. Inspiration is everywhere! Right now I'm loving the colors and graphic design elements in this row of old books that are sitting on the top shelf of my desk. It's so interesting to look back on how my work has changed over the past few years. There are always going to be new patterns, designers, and color schemes that influence what I'm doing. I spend a good amount of time each month looking at design trends in a number of areas besides sewing -- fashion, graphic design, interior decorating -- and it's been a great learning process for me. I've seen my tastes swing back and forth between modern and traditional, landing somewhere in the middle. I've also really come to value simplicity in design. I've said it before, and I'll say it again -- there's nothing more important than to make what you love. I think it's great to challenge yourself every now and again by trying something new, but it's a mistake to try to be something you aren't. The longer I sew, the more clearly I understand what I really love to make and the less likely I am to jump on a bandwagon that isn't for me. Of course, I can still appreciate the talent and thought that have gone into a project, even if it isn't something I would make myself. That's the beauty of this online creative community. Mostly I'm just incredibly grateful to have the chance to not only sew projects that make my heart sing, but to share them with people who care to hear about them. This blog has been one of the most amazing experiences of my life. It depends on what I'm making. I've become really interested in how bags and other accessories are put together. I love to walk through the purse section of a department store and spend time looking at seams and taking photographs of interesting shapes. I'm sure the salespeople think I'm crazy, but I find it absolutely fascinating. I always get ideas for things I'd like to experiment with in bag patterns of my own. When it comes to quilts, there are projects that I make to showcase fabric, and then there are fabrics I use because they let the pattern shine. I'm a stickler for getting things just right when it comes to design elements in any project I make. I'm not devastated if a pair of blocks don't match up perfectly or if my seams aren't pressed exactly right, but if I choose the wrong print for a quilt binding, it's going to haunt me every time I look at it. I probably spend more time on project design than on anything else, but I don't mind because it's definitely my favorite part of the process. I hope you've enjoyed a little peek behind the curtain at how my creativity works. I've asked two of my oldest and dearest blogging friends to share with you next Monday. 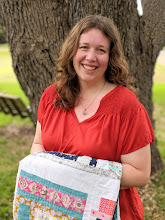 Beth is the amazing woman behind Plum and June, a blog which has done so much to promote and connect new sewing bloggers all over the world with her annual New Quilt Blogger Blog Hop. She always inspires me with her fearless sewing and her incredibly stunning photography (just look at this post to see what I mean). Becca writes a lovely, witty journal of her sewing adventures at Bryan House Quilts. She has a great eye for color and more patience with half square triangles than I will ever have. Mostly, though, I just desperately want her Nikki Tote Bag. Both of these ladies have been a huge encouragement to me in my own sewing journey, and I can't wait to see what the year ahead holds for them. It's been a busy week of jumping back into a school schedule, which is both a tough adjustment (no more staying up until midnight watching Burn Notice with my husband) and a good one (little girls who are busy with classwork have less time to drive each other bonkers). Bunny has been begging me for another sewing lesson, and a special fabric package gave us the perfect opportunity for a new project. Illustrator Missy Kulik sent me a few of her cute designs on fabric this summer so that I could sew something up with them for my blog. Bunny immediately fell in love with the strawberry print, and we spent an afternoon making a new pillowcase for her bed. I even let her do a little sewing all by herself for this one, and I don't think I've ever seen her so proud. It's been a while since I've posted a fabric audition on the blog, but I'm hoping to share at least one or two of these each month from now on. Along with a curated stack of fabric, I'll be sharing a Pinterest board of photos to go along with the theme as well as a project made from the auditioned prints. I always enjoy auditioning fabrics, and adding these last two steps to the process has been so much fun! Today's stack is inspired by the sunny shades of Palm Springs, that famously lovely desert spot located just over an hour away from where I live. I've had some wonderful vacations there with family and friends over the years. The heat is intense, but beautiful views and great food make up for it. You'll find some fabulous examples of retro design there too, several of which you can see on my Palm Springs Fabric Audition Pinterest board. I decided to make a simple striped pouch from this audition. These prints look great with yarn dyed Essex linen in leather, and I love the orange Aurifil thread that I used to quilt the front and back. The pouch is lined in the floral Heather Bailey print which is such a happy thing to see each time I open that zipper. I have more fabric auditions in the works as we speak, but feel free to let me know in the comments below if you have any themes or color palettes that you'd like to see me tackle this year. If I put something together with your idea, I'll be sure to give you and your blog a mention in my post!